These stuffed parathas are ideal even as packed meal. The stuffing serve as a dry side dish by itself so enjoy the health benefits of legumes in each bite. Lentils, a small but nutritionally mighty member of the legume family, are a very good source of cholesterol-lowering fiber. They are of special benefit in managing blood-sugar disorders since their high fiber content prevents blood sugar levels from rising rapidly after a meal. Just 230 calories for a whole cup of cooked lentils. Sift in flour, salt, oil in a mixing bowl, add water little at a time to form a soft dough. Knead the dough very well and keep aside for 15minutes. Divide the dough into equal portions and set aside. Rinse and soak brown lentils and red lentils for 2-3 hours. After soaking rinse and drain. Once cooked mash the dal using potato masher/hand and to this add in chopped dill leaves, onion, minced chillies, garlic, dry mango powder and salt if required (as we have already used while cooking the dal) and mix well until well combined. Take a portion of the dough, roll a little flat and place1-2tablespoon of the filling in centre. Close from all sides and roll as thin as you can without tearing. Heat a tawa/griddle and toast parathas by drizzling some oil and cook until dark brown spots appear on both sides. Serve hot with yogurt/pickles/ yogurt dips. Its important that the dal is free from moisture or if its mushy cant do the stuffing so if your not used to cook in the pressure, feel free to cook on the hob or microwave. Posted on October 10, 2014, in Indian, Main dish and tagged Chitras healthy kitchen, drchdietfood, Lentil Parathas, Stuffed healthy parathas. Bookmark the permalink. 18 Comments. 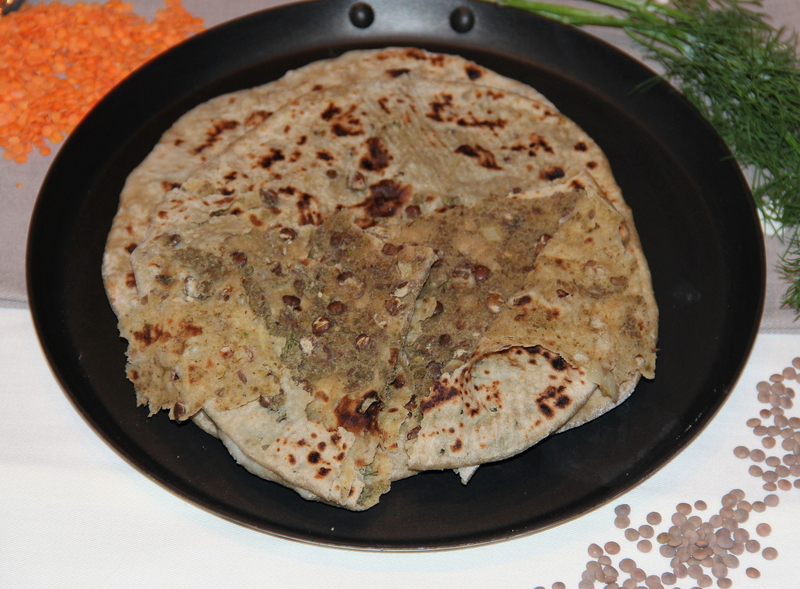 Great combination…have never tried lentil parathas with dill.